When it's time for your next get-a-way, hook up this Avenger travel trailer for a great time that is sure to leave lasting memories. You will enjoy a front private bedroom with a queen bed, and two closets for all your clothes. This unit features large double bunks that the kids are sure to love, plus the dinette can be folded down for a little one to sleep on at night. 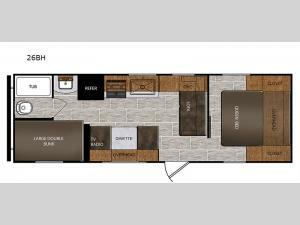 With all the kitchen amenities, including a three burner cooktop, and a deep basin sink, you'll have everything you need to prepare a home cooked meal in this trailer. This model also includes a private toilet and tub room with a sink and overhead medicine cabinet just outside the bath door! Get an early start on your next camping trip with this Avenger travel trailer!